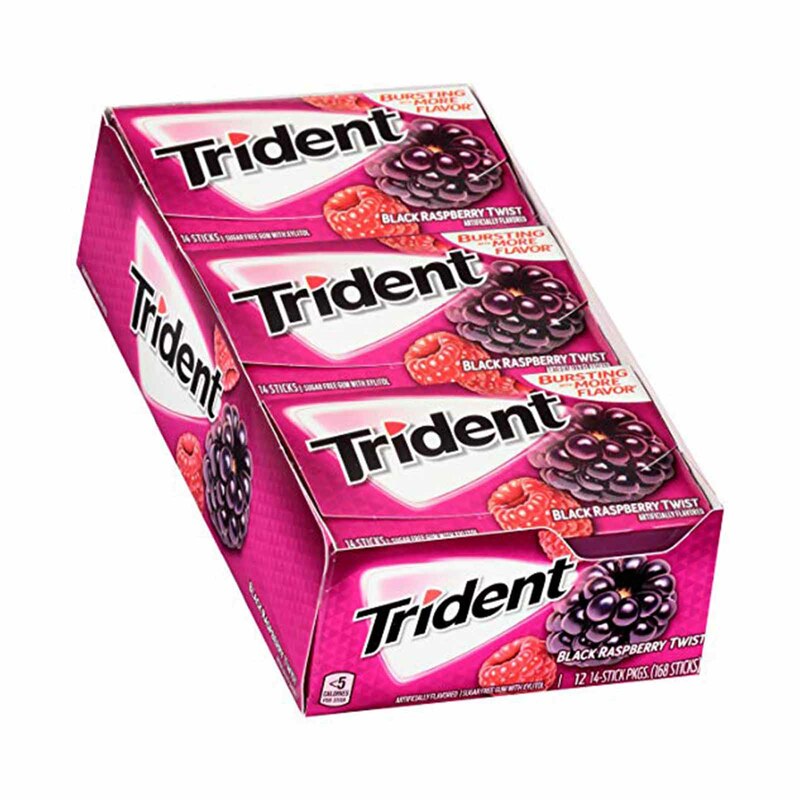 Pop a piece of mouthwatering Black Raspberry Twist Trident for a refreshing taste that keeps going as long as you do. This order includes 12 18-stick packs of Black Raspberry Twist Trident Sugar Free Gum. Get close-up confidence with Trident Sugar Free gum, the easy way to freshen breath and help protect against tooth decay. Four out of five dentists recommend chewing Trident after eating and drinking to clean and protect teeth. With 30% fewer calories than sugared gum, Trident is sweetened with Xylitol which provides long lasting flavor, fights plaque, and restores pH balance to maintain healthy smiles. Pop a piece of mouthwatering Perfect Peppermint Trident for a refreshing taste that keeps going as long as you do. This order includes 12 18-stick packs of Perfect Peppermint Trident Sugar Free Gum. Pop a piece of mouthwatering Minty Sweet Twist Trident for a refreshing taste that keeps going as long as you do. This order includes 12 18-stick packs of Minty Sweet Twist Trident Sugar Free Gum. Pop a piece of mouthwatering Spearmint Trident for a refreshing taste that keeps going as long as you do. This order includes 12 18-stick packs of Spearmint Trident Sugar Free Gum. Whiten teeth and get close-up confidence with Trident White Sugar Free gum, the easy way to freshen breath and help protect against tooth decay. Chewing two pieces of Trident White Sugar Free Gum after eating and drinking helps whiten teeth in as little as four weeks. With 30% fewer calories than sugared gum, Trident White has long lasting flavor, fights plaque, and restores your mouth's pH balance to maintain a healthy smile. Pop a piece of mouthwatering Minty Bubble Trident White for a refreshing taste that keeps going as long as you do. This order includes nine 16-stick packs of Minty Bubble Trident White Sugar Free Gum.